This week, I learned all about time management! In order to effectively take time for self-care, it is important to be conscious of how you spend your time. In college, I waited until I got home from class to do assignments and barely worked on them during my breaks throughout the day. The evening was always when I could concentrate the best anyway. However, so far during my internship, I have learned that this method will not always be the best way to get things done and it prevents me from having much time for myself. 1) Leave work at work. I struggle with this because I concentrate better at night time. However, this week, I learned that if I plan for the next day when I get home at night, I don’t have any time for self-care. I get home late every evening and when I should be relaxing and winding down from the day, I’m planning or working on something. Don’t do that! Plan, document, and prepare at work; only work on minor preparation tasks and practicing repertoire at home. This week, I realized that utilizing the preparation/documentation periods that are built into your schedule during the day to the fullest potential, means that there will be less to do at night, which means more time for self-care. If you take care of yourself, you’re better able to help others. I’m a planner and like to plan out every single thing that could possibly happen during the day or in a session. However, like most of us know, plans leave little room for flexibility and may not fit the needs of the client for that specific day! Of course it’s good to be prepared for everything that could happen and have an outline of the interventions that will be used to target the client’s goals/objective, but every single detail doesn’t need to be planned out; this week, I’ve learned that being flexible during a session is SO important. When something goes differently than what you expected, it is important to have those back pocket interventions you can use, that way the client is always working towards their goals. I’m wrapping up my third week as a music therapy intern and I am starting to feel more comfortable with Springfield as well as with my internship. 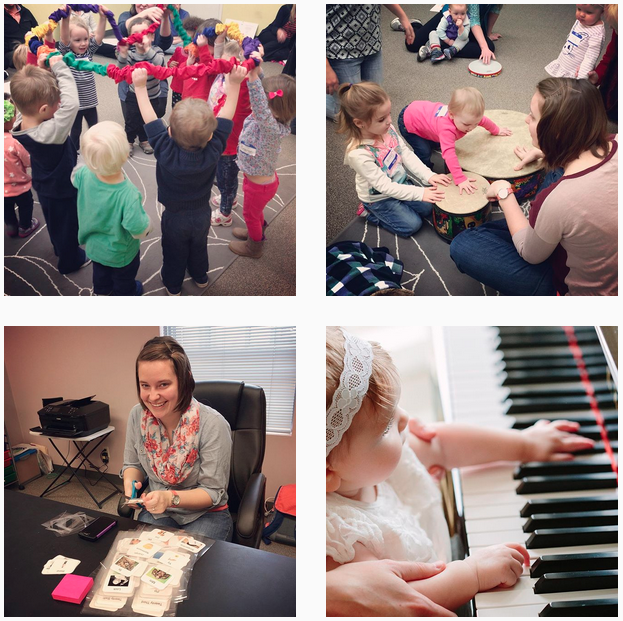 I have the chance to work with so many different people at multiple sites and I feel truly blessed that I am in this environment surrounded by respected and talented professional music therapists! Even though this week I started to get more involved in the students’ sessions and I have loved every minute of it, I’ve encountered some struggles that I am slowly working through. Confidence. It’s an issue that I have been dealing with recently. Like most other musicians and people in this world, I strive to be perfect in everything that I do and when I am not perfect or succeed in doing something, I lose confidence. This often leads to me not being able to progress or learn a new skill. I realized this week that nobody is perfect and I will never be perfect; it’s okay to make mistakes as long as you learn from them. I often lose my confidence when I’m singing. When I sing in my car, I sing like no one is watching because literally, no one is watching. But when I sing in front of my supervisors or in other places, I lose my confidence because I am afraid of sounding terrible, which actually makes me more nervous. This in return ruins my breathe support and creates an airy sound and the cycle continues. If I just think to myself that nobody is perfect and sing like I sing in the car with all the confidence in the world, I can accomplish amazing things. Confidence is an issue for me, but it doesn’t have to be a detrimental. I know that I have the skill set required to sing as well as to be an effective music therapist; I just have to believe in myself and have CONFIDENCE. I’ve started to work on it this week and will continue to do so throughout my internship. I’m excited to look back at this moment six months from now and see how much I’ve grown. Hello! I just finished my second week of my internship and I feel that I have learned a significant amount in a very short time. That being said, I am excited to see the amount of knowledge that I will have learned by the end of my internship! One of the hardest things that I have dealt with in the past two weeks is getting adjusted to living in a new place. I’ve moved around my entire life and while I attended college in Michigan, my parents lived in Georgia and North Carolina; that being said, I am very used to living far from my family. However, since I did live so far from my family and couldn’t see them for months at a time, I built friendships as well as a support system with the friends I met in classes, extracurricular activities, and at different jobs. Moving to Springfield has been interesting for me because I no longer have that immediate support system physically surrounding me. I know that I can always call friends and family on the phone or on Skype, but sometimes life gets busy. There are some things that I have learned in these past two weeks that have helped me cope with living in a new place that might help students looking at internships far away or other interns who are going through the same thing as me! When you’re not at your internship, make sure you get out of your apartment/house. This is the hardest for me because I don’t like driving in new places. However, it is extremely important! A person can only watch Netflix or do paperwork for so long. Leave your apartment and go exploring. If you’re living in a city, walk around downtown or explore a nearby mall. Look online for things to do in the city or town where your internship is and make sure you get out and do the ones that interest you! Find a hobby! Volunteer! Do something that you love and get involved in anything. It’s a perfect way to meet new people and start developing that support system away from home or college. I am looking into options to volunteer right now and have started going to church and getting involved that way in order to meet new people. This has been the biggest challenge because in college, you’re forced to meet new people every day. However, in the “real” world, you have to find ways to meet new people without relying on class or a job. When you feel overwhelmed about being in a new place, make sure you’re open and honest to your supervisors or call up a friend or a family member and share with them about how you are feeling. Living in a new place is scary and it’s important to know you are not in this alone! I have found those three things to be helpful with getting adjusted to moving to a place where I know absolutely no one. It’s scary at first, but I am excited to meet new people and start getting involved with different activities! Hello everyone! My name is Sammy Springer and I am the new intern at Music Therapy Connections. As everyone knows, Alisabeth was the previous intern and is now currently a music therapist at Music Therapy Connections! I will be carrying out her tradition of writing blogs for the Intern’s Corner for the next six months. That being said, I thought I would share some information about me this week so you all could get to know me a little better. I grew up in Middleton/Madison, Wisconsin and went to college to study music therapy at Western Michigan University in Kalamazoo, MI. My primary instrument is the flute and I have been playing since I was eight years old. However, I also love playing the guitar and the piano! Since my junior year of high school I knew music therapy was the right career path for me; it seems unbelievable that I just finished my first week of my internship, but nonetheless, here I am fulfilling my dreams! My first week as an intern was a little overwhelming, but overall, exciting. I am so excited and ready to learn everything that I can during the next six months! During this week, I mainly observed sessions where I was able to learn a lot about songwriting, assessments, self-care, and different therapeutic processes. Take a journal with you everywhere. My internship directors recommended this to me this week and I found it to be extremely helpful. Just this week I filled pages with observation notes, lyric ideas, and lists of everything that I either needed to do or remember. Also, journaling or even taking notes during sessions throughout the day is a wonderful way to go back and reflect at the end of the day. It’s an important part of the learning process to reflect on everything! Writing original songs is not that scary! Writing your own songs is important because you can write a song that can be tailored to each individual and their specific goals/objectives. Writing original songs and becoming comfortable sharing them is a goal of mine. It may seem taunting at first, but it really isn’t that bad! I encourage everyone, especially students and new interns, to try writing their own songs and sharing them. I wrote one this week and had to share it with my supervisors as well as the other music therapists, and I got through it just fine. I am not sure how many times I have heard this throughout my lifetime, but it is just starting to click for me. Going to bed at a decent time, eating healthy, and taking time out for ourselves each day is extremely important. This week I started going to bed early every night and noticed a huge increase in my energy level. Although, I am not very good at practicing self-care right now, but it is something that I will concentrate on practicing for the rest of my life. If we don’t take care of ourselves, there is no way that we can help other people. I am excited to learn more self-care techniques and start practicing them!